Remarkable demonstration in theater shows big improvement in seeing and hearing by radio. New process used to aid planes blinded by fog. TWO remarkable developments recently revived public interest in television, and brought the dream of practical transmission and reception of “images on the air” a step nearer realization. In a dramatic demonstration at Schenectady, N. Y., a few weeks ago, Dr. E. F. W. Alexanderson, consulting engineer of the General Electric Company, projected six-foot images bright enough to be seen by a large gathering. Before that, the best television image had been only a few inches square and had been produced by the feeble flickering of a neon tube. 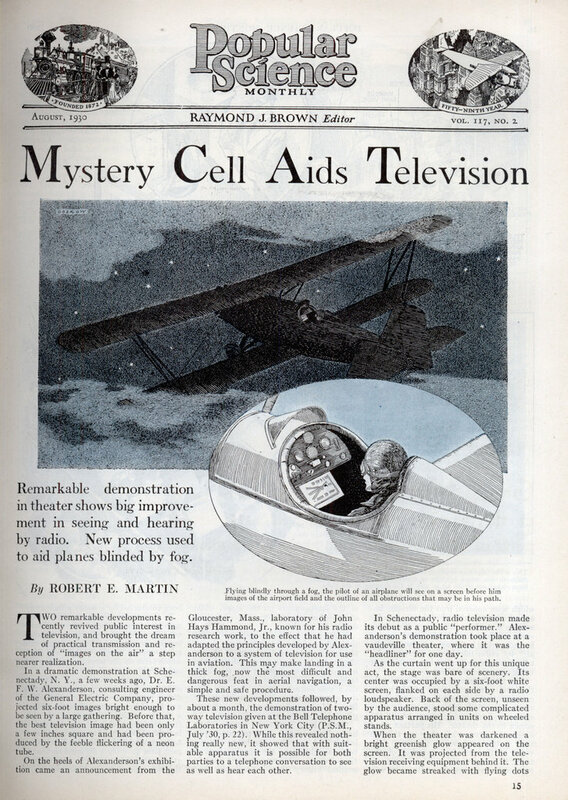 On the heels of Alexanderson’s exhibition came an announcement from the Gloucester, Mass., laboratory of John Hays Hammond, Jr., known for his radio research work, to the effect that he had adapted the principles developed by Alexanderson to a system of television for use in aviation. This may make landing in a thick fog, now the most difficult and dangerous feat in aerial navigation, a simple and safe procedure. These new developments followed, by about a month, the demonstration of two-way television given at the Bell Telephone Laboratories in New York City (P.S.M., July ’30, p. 22). While this revealed nothing really new, it showed that with suitable apparatus it is possible for both parties to a telephone conversation to see as well as hear each other. In Schenectady, radio television made its debut as a public “performer.” Alexanderson’s demonstration took place at a vaudeville theater, where it was the “headliner” for one day. As the curtain went up for this unique act, the stage was bare of scenery. Its center was occupied by a six-foot white screen, flanked on each side by a radio loudspeaker. Back of the screen, unseen by the audience, stood some complicated apparatus arranged in units on wheeled stands. When the theater was darkened a bright greenish glow appeared on the screen. It was projected from the television receiving equipment behind it. The glow became streaked with flying dots which soon cohered into the life-size image of a pretty girl who sang a popular song in a studio a mile away. There her voice was broadcast in the usual manner by radio, while her image was “put on the air” by radio television. She heard by telephone the orchestral accompaniment being played in the theater. The telephone again came into play in the next number, a team of black-face comedians who put on a novel television stunt. One of them was in the television studio and his image appeared on the screen in the theater. His partner stood beside the screen while they ran through their patter and songs together. The voice of the televised member of the team, like that of the girl in the preceding number, reached the audience by way of the loudspeakers on the stage, while the voice of his partner was transmitted to him by telephone. Following a couple of similar acts came the climax of the demonstration. Upon the screen appeared the image of the orchestra leader who, holding a short baton in one hand and clasping the telephone to his ear with the other, stood in the studio a mile distant. As the shadowy conductor on the screen raised his baton, the flesh-and-blood musicians in the orchestra pit of the theater came to attention. “Now, boys,” said the leader, “let’s have the overture. And put some pep into it!” A flourish of the baton and the boys launched into the opening bars of the selection. This was the first time in musical history that an orchestra had been conducted by a leader a mile away! In the studio, the transmission of images was accomplished in the usual manner. Basically, the television broadcasting process consists of transmitting, with great rapidity, streaks of light and shade which form on the screen a complete image (P.S.M., Mar. 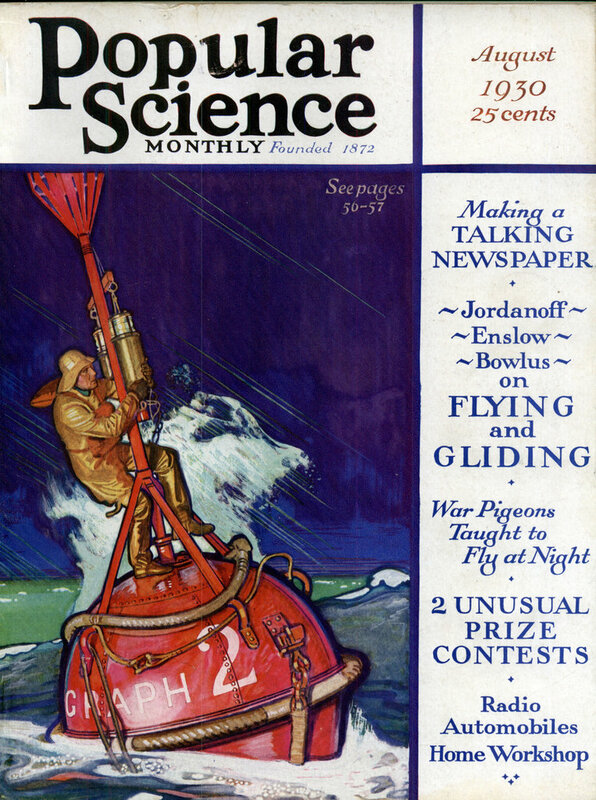 ’27, p. 37). The brightly illuminated person or object to be televised faces a scanning disk, a round metal plate provided with a number of holes arranged in the form of a spiral. As this disk revolves, the light from the image behind it is broken up into individual rays that fluctuate in brilliancy to correspond with the light and dark areas, each time covering a different section; in other words, “scanning” it. Each hole in the disk represents one horizontal line of the picture and of course, one complete revolution of the disk constructs a complete image. As the scanning disk rotates, the light and dark portions of the horizontal section of the image are translated, by means of a photo-electric cell, into corresponding electrical pulsations. These impulses are sent by radio to the receiving apparatus and there amplified and translated back into light vibrations. In Doctor Alex-anderson’s demonstration, the disk had forty-eight holes and rotated at twenty revolutions per second. So far, there was nothing really new in the experiment. It was at the receiving end that the new development was brought into play. In the usual television receiving apparatus, the amplified electrical impulses cause a neon light to flicker. This light is intercepted and broken up by a second scanning disk the holes in which correspond to those in the disk at the transmitting end, so that each horizontal strip of light produces on the screen the same gradations of light and shade. NOW, Alexanderson’s improvement involves the light source and the method of controlling the light in projecting the television image. Instead of the pinkly glowing neon tube, Doctor Alexan-derson used a powerful arc lamp, which supplied a steady and very strong light. He was enabled to do this by the use of a remarkble new light valve, or light shutter device, operating at enormous speed. This valve, known as the “Karolus cell,” was developed by Doctor Alexanderson from an invention by Dr. August Karolus, of Leipzig, Germany. By means of the Karolus valve, Doctor Alexanderson interrupted the flow of light from the arc through the holes in the scanning disk in the receiving set on the stage. The light valve was, in turn, controlled by the received television impulses. The Karolus cell, which contains nitrobenzol,was placed between two prisms, which polarized the light so that it vibrated in one plane only. This was necessary because the new light valve works only on polarized light. The original Karolus cell was delicate and extremely short lived. Just how Doctor Alexanderson has succeeded in perfecting the valve to the point where it will stand continuous operation under the strain of a high intensity light such as the arc produces, remains his secret. The new Hammond invention, which is of great interest to aviators, also makes use of the Alexanderson development of the Karolus light valve. With this development, he has combined a method used in the Navy to duplicate, at a distance, the position of the loop used to take radio compass bearings. When Hammond’s invention is perfected, the aviator landing in fog or darkness will see before him, just below his regular instrument board, a screen on which will appear a bright image showing every detail of the landing field. Hangars, runway, and the obstructions to aerial navigation at the edges of the field will appear. A round black spot also will show on the screen and this spot will represent the exact position of the airplane over the field. AS HE sails through the air the spot will move across the tiny map in duplication of his own motion. If he sees the spot representing his airplane heading for some obstruction on the field, he has only to correct his controls, change his course, and the black spot will immedi- ately show by its motion on the map what his change in course has accomplished. At the corner of the map will appear figures indicating wind velocity and the map itself will show the direction of the wind. No matter how thick the fog or how dark the night, the aviator’s map will be as brightly lighted as the field itself would be on a clear sunny day. THE method by which this startling result is accomplished is, when analyzed, relatively simple. On the plane there will be a small radio transmitter which will send out a continuous stream of radio waves. These radio waves will be picked up by three radio compass stations equally spaced around the outside edge of the field. At one side of the field, out of the way, will be a television transmitting station, and in this station will be located the unique apparatus which makes the whole invention possible. A conventional type of television transmitter will be set with the lenses pointed straight down. Under this television scanning unit will be a miniature reproduction of the entire field. Every detail of the field and surrounding obstructions will be reproduced in small size to exact scale. Strong lights will be centered on this miniature flying field. The model field will be mounted in such a way that it can be moved in any direction under the “eye” of the television transmitter by means of three position controllers, each one automatically operated by the corresponding compass station. The exact means by which this will be accomplished has not yet been revealed by the inventor, but some such scheme as that shown in the accompanying illustration probably will be used. Slotted arms duplicating the actual radio bearing will move the model flying field. Three arms will be necessary because that number of bearings are needed to locate a point. The spot representing the plane in the television image of the flying field probably will be a tiny disk set at the focal point of the lens system used in the scanning equipment. Its shadow would then appear on the image of any object scanned by the television transmitter. Although Hammond has said that he uses the Alexanderson system of televisionâ€”which means, of course, the Alexanderson type of Karolus cellâ€”it is hardly probable that he intends to install an arc light in the plane’s television receiver. However, the new light cell could be used with any source of illumination and in an airplane, where space and weight are limited, a concentrated filament nitrogen-filled electric bulb would give adequate light for a screen of the size contemplated. Now that the problem of producing a large and bright television image has been solved, who will be the first to find a way to produce a really sharp, clearly defined television image â€”and to make the receiving scanning disk always keep step with the transmitting disk? Only a short time ago these three difficult problems confronted the televisionist. One is solved. Two still remain to be conquered! Fascinating description of the light valve. Works something like a liquid crystal? A gauge with intersecting indicator needles?